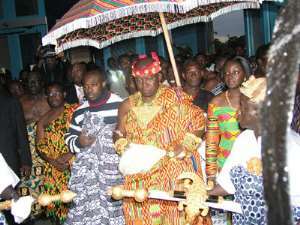 Abuakwa (Ash), May 20, GNA - The Asantehene, Otumfuo Osei Tutu II, has ordered the destoolment of Nana Awuah Kroko, the chief of Apemhaase near Abuakwa. He was found guilty of lying to the Asantehene. Nana Agyei Achamfour, a senior linguist of the Asantehene, told the Ghana News Agency at Abuakwa on Wednesday that Otumfuo Osei Tutu entrusted a parcel of land near Tanoso to the care of Apemhaasehene with specific instructions not to sell any part of it. He said the chief ignored the instructions and secretly sold out two of the plots to some people and appropriated the proceeds. Nana Achamfour said the Asantehene got wind of that and summoned the chief who flatly denied having gone against the instruction given to him. He said those who bought the plots however, gave him out and showed documents, proving that Nana Kroko indeed had sold the plots to them. Meanwhile, Nana Kroko has handed over the stool regalia to the Apemhaase royal family.